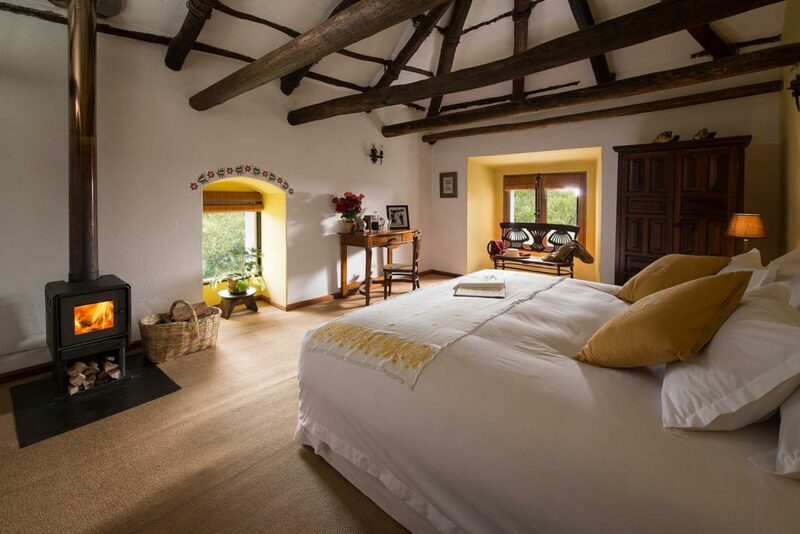 Hacienda Zuleta is the ultimate luxury farm-stay in Ecuador. 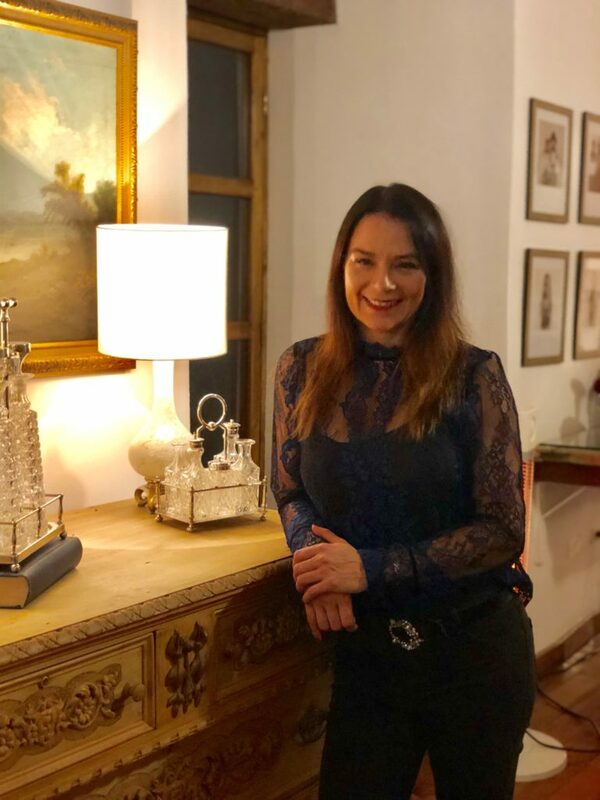 It’s not often you can say you slept in the home of a President, but after a stay at Hacienda Zuleta in Ecuador, you can say exactly that. 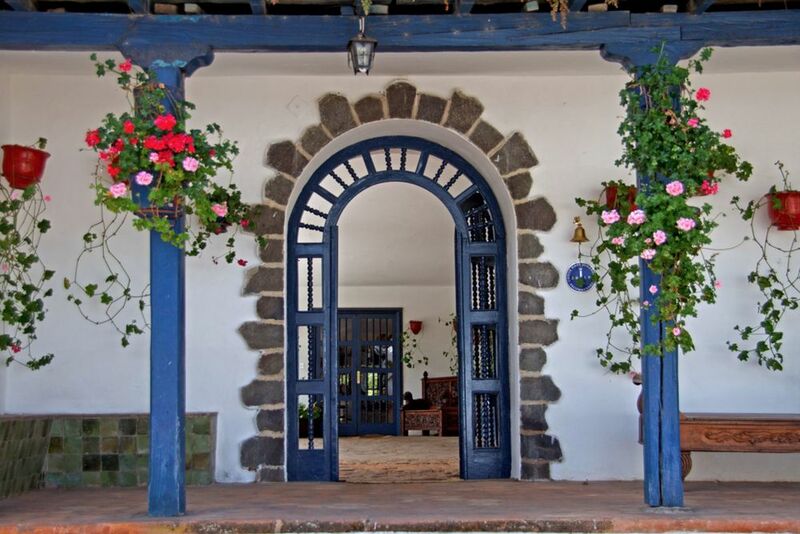 Haciendas are the ultimate in sprawling Ecuadorian farm houses, and Hacienda Zuleta in the Andes, a 2000 hectare property sitting at 9600 feet above sea level, is the most luxurious of them all. This stunning 17th century eco-lodge is the stuff of dreams. 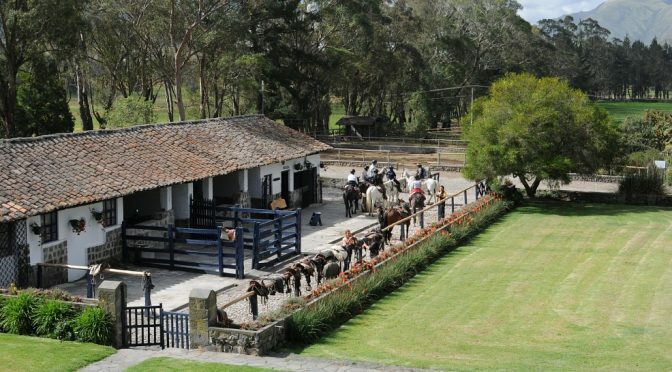 Today it is still a working farm to horses, cows, crops, a trout farm and even a cheese factory, and it was the home of the former President of Ecuador, Galo Plaza Lasso. The family of the President have owned the property for over 100 years, and the feel is more like staying as a guest in someone’s private home, rather than a hotel. The vast, opulent homestead is littered with the family’s antiques, photos and colonial history. You can even sit at the President’s own desk, and the drawers still contain his old note pads. In many ways it is a journey back in time to the country’s colonial times, and there is much to be learned about politics, conservation, subsistence farming and values in this lush, green, fertile, part of the world surrounded by inactive volcanoes. Guest accommodation is in 23 beautifully tailored rooms and suites, and no two are the same. There are rooms with huge windows overlooking the courtyard, rooms overlooking the stables, and others have direct access to the gardens. Each room or suite has its own log fire the staff light each night for you, and bath tub. Rooms feature home-made embroidery which is made on the property and sold in a quirky little on-site shop. 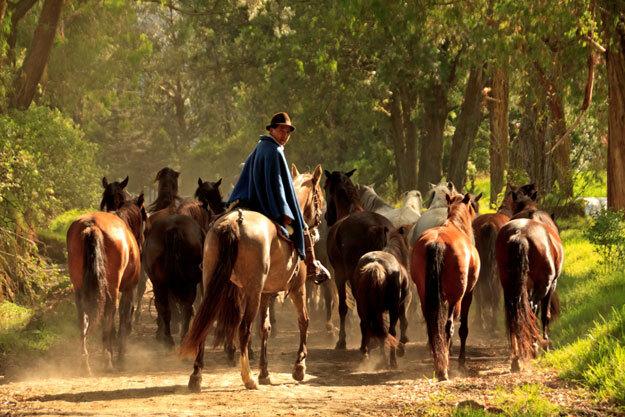 The 100 horses raised there, Zulutenos are bred specifically for the Hacienda, and there is a brilliant indigenous horseman who has been raising and working with them for 28 years and has a horse for every ability, person and occasion. I have been riding all my life and have never seen horses so well reared. There is even a condor conservation project on site, which was a highlight for me. These majestic creatures are as elegant as they are intimidating when they spread their wings, and a conservationist goes to great lengths to explain the curse of the condor, where they are at why they are in danger, and about the other wildlife in the area which includes bears and foxes and other birds. Meals are occasions to be celebrated, and are a showcase of Ecuadorian delights including produce from the Hacienda’s own extensive organic vegetable garden, soups, a national dish and trout from the property’s own trout farm, steaks, stews and so on. Guests visit the hacienda from far and wide, and you can sit on a share table – a guarantee of great dinner conversation. 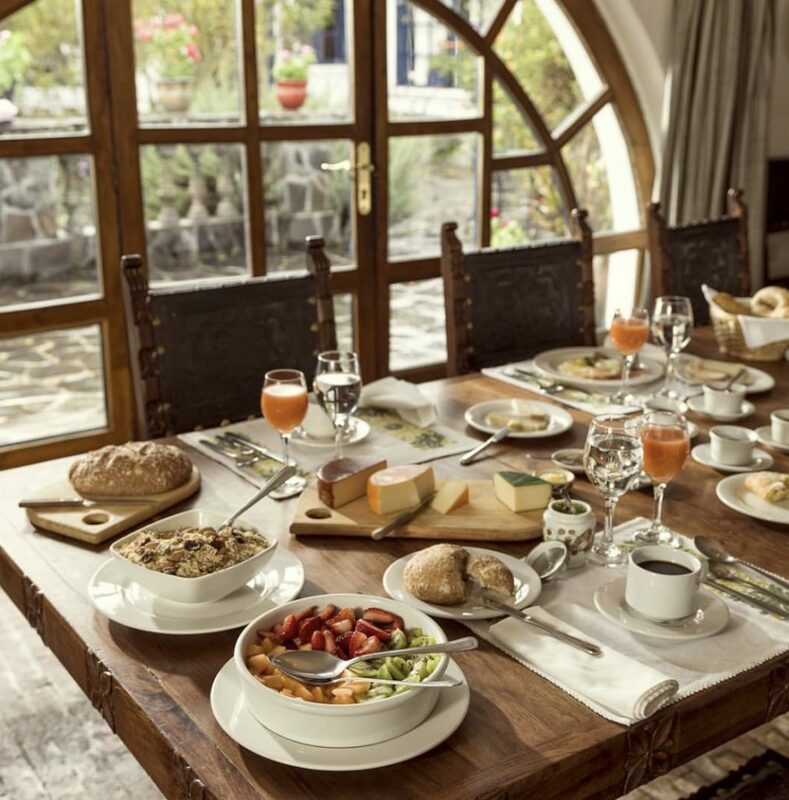 Home cooked Ecuadorian meals are a highlight at Hacienda Zuleta. Three three course meals are included in the tariff. There are also cooking classes available. It is surprising how much there is to do on the farm, and how enjoyable the location is. There are mountain bikes, multiple hikes, drives, and walks. I absolutely loved the spirit of the Hacienda. You could almost feel the footsteps of the great men who have lived there, and the Ecuadorian history within the home. Beautiful. Who should Stay here: Families, couples, groups of friends, solo travellers. Who shouldn’t Stay here: If you are unable to walk far, your experience will be limited. Location: Fly into Quito, and the rive is about 2 hours. (Uber works in Quito). Best culinary delight: Lunch and dinner are incredible. The Highlight: Horse riding and the condor conservation project. The lowlight: Be prepared for altitude sickness – it is hit and miss who gets it (I do).